Cost to lay a stamped concrete patio varies greatly by region (and even by zip code). Get free estimates from Concrete Contractors in your city. Cost to lay a stamped concrete patio varies greatly by region (and even by zip code). The average cost of laying stamped concrete patio is $3,450​. How much does it cost to lay a stamped concrete patio? Laying a stamped concrete patio is a great way to make your backyard more attractive and add extra leisure space. 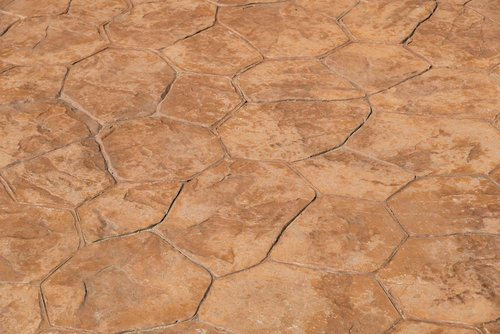 Stamped concrete is made to look like many other paver materials, such as natural stone, ashlar, granite, or brick. It is an affordable alternative to using these sometimes expensive materials, and looks very realistic. Stamped concrete is more stable than pavers since it’s one solid mass rather than multiple bricks or stones, and that enables you to create a smooth, continuous surface. Many homeowners choose to add stamped concrete to their properties because they can easily add recoupable value. The price you are charged for your stamped concrete patio project is dependent on factors like labor needs, concrete patterns, and detailing. This cost guide will determine the average cost of laying a stamped concrete patio of 16’ x 18’ (288 sq. ft.). Stamped concrete is made as it sounds: through stamping. While the concrete is wet, stamps with particular patterns are pressed onto the surface, creating a textured look. Popular styles are herringbone, flagstone 1 and cobblestone 2. It is usually then dyed in colors most suitable to achieve your desired appearance. It usually takes 32-36 hours to complete the installation process for a patio of 16’ x 18’ (288 sq. ft.). That’s 4 to 4 ½ total working days. Contractors will either serve you an itemized bill, or one based on cost per square foot. Which one your contractor chooses largely depends on their preference, but typically, you can expect that smaller projects will get itemization. Excavation: If your land needs excavation or significant grading 3 prior to building the patio, expect total costs to increase by 50%. Basic: Stamped concrete installation with one simple pattern (ex: herringbone or ashlar) and one color. Cost: $8-$12 per sq.ft. Total: $2,304-$3,456 for 16’ x 18’ (288 sq. ft.). Mid-range: Customize stamped concrete plus borders, or a second pattern or color. Cost: $12-$18 per sq.ft. Total: $2,304-$5,184 for 16’ x 18’ (288 sq. ft.). High-end: Highly detailed stamped concrete including multiple patterns and colors. Can include specialty patterns and hand-coloring made to mimic natural stone color variations. Cost: $18+ per sq.ft. Total: $5,184+ for 16’ x 18’ (288 sq. ft.). Painting and sealing stamped concrete can give it even more visual appeal. The average cost of this is $0.70-$0.86 per sq. ft. ($200-$250 for 16’ x 18’ [288 sq. ft.]). Using detailing tools in addition to the basic stamps can add richness to your patio’s appearance. Detailing is done while the concrete is still wet so that custom patterns and textures can be easily carved. This typically costs $225. If you have an old patio that needs to go before the new one can be built, you’ll need to hire a removal and disposal service. The average cost of this is $125-$250. Keep in mind that if your old patio’s concrete is in good condition, you can lay the new stamped concrete over it. Experts don’t recommend DIY installations. Laying stamped concrete is a meticulous, time-consuming process that involves many steps that must be completed within short windows of time. This requires a high degree of skill and preparation that usually only professionals possess. Also, equipment necessary for installation is very expensive. You’d have to spend hundreds of dollars on tools you’d likely only use once. Stamped concrete patios can last for decades. They will inevitably develop cracks over time because they are solid platforms on a gradually-shifting surface (the ground). However, they have high durability and are very resistant to cracking when installed properly. Regular maintenance is needed to keep cracks and other damage at bay. You’ll need to apply a sealant every 2 years or so to protect your patio ($25-$30 per gallon). Since stamped concrete patios can be slippery when wet, they’re not recommended for properties rainy climates. During the rainy season in your area, we suggest applying an anti-skid formula to your patio ($30 per gallon). Because stamped concrete patios last a long time, are highly attractive, and provide outdoor leisure space, they easily add to your home’s resale value. You can expect a high return on investment. How much does it cost to lay a stamped concrete patio in my city? Cost to lay a stamped concrete patio varies greatly by region (and even by zip code). To get free estimates from local contractors, please indicate yours. Cost Considerations: Flagstone costs an average of $15 to $30 per sq. ft. Laying flagstone with the space between the stones filled with gravel can be as cheap as $10 per sq. ft., but it is not as durable or attractive as a path with the stones held together by mortar. Cost Considerations: Paving with cobblestones costs an average of $1,100-$1,800 per 100 sq. ft. installed depending on the quality of the materials, compared with $850 to $2,000 for flagstone.